Lucky Numbers Scratch Card Review - Casino Answers! 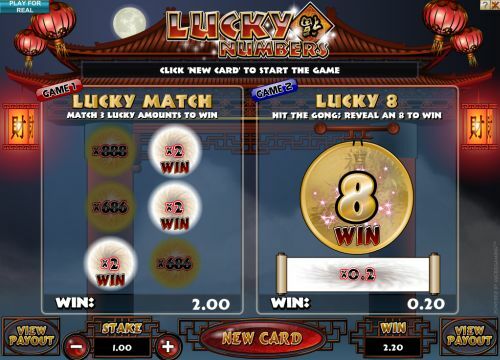 Lucky Numbers is an instant win scratch card developed by Microgaming. You can play the Lucky Numbers online scratch card at Bovada. Bets on the Lucky Numbers scratch card are $0.50, $1, $2, $3, $4, $5, $6, $7, $8, $9 and $10. The betting range should suffice for most online scratch card players. To play, select your stake with the “+” and “-” buttons and hit the “New Card” button. From here, you can use “Reveal All” to scratch the entire card automatically or you can click on each object to reveal the results yourself. On the Lucky Match game, if you match 3 symbols of the same prize amount, you will win that prize. On Lucky 8, you will hit the Gong once. If the Gong reveals an “8,” you will your win will bet your bet amount multiplied by the figure listed below. The most you can win on the Lucky Numbers scratchie is 8888X your bet. For example, if you are able to match three 8888X symbols on the Lucky Match game when betting $1 per scratch ticket, you will win $8888. The next highest payout is 6868X your bet, which is rather formidable itself. As far as the Lucky 8 games goes, you can win up to 88X your bet. You can win these payouts and so much more when you play the Lucky Numbers scratch-it lottery ticket at Bovada! If you’re looking for two chances to win instantly playing a scratch card, Lucky Numbers is a superb choice! There are two different games to play and some very good payouts to win. You can play the Lucky Numbers scratch lottery ticket at Microgaming flash casinos such as Bovada! Can USA residents play the Lucky Numbers instant win scratch ticket game for real money? No, American players cannot play the Lucky Numbers scratch card or any of the games at Microgaming online casinos at this time. Instead, we recommend that you read our Lucky 8s Scratch Card Review or play it at USA-friendly RTG casinos like Bovada. Do I need to download any casino software to play the Lucky Numbers free scratch card game? 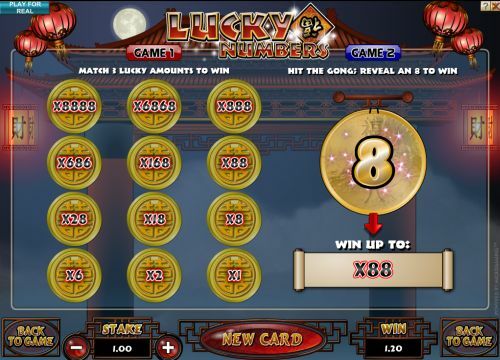 No, the Lucky Numbers scratch and win game is not available on the Microgaming downloadable casino client at this time. Instead, you can play the Lucky Numbers flash game at Bovada for free or real money. If you have any issues with the flash casino, be sure to update your version of Adobe Flash Player. Where can I read more online scratch card reviews? For a full listing of scratch cards plus many different online scratch card reviews, please read our list of online scratch cards right here at Casino Answers.